Thread veins or what are commonly known as “spider veins”, are tiny veins on the skin surface itself. As the synonym suggests they have a star or spider like appearance, often disappearing when applying pressure onto them. They often look like thin red lines on the skin, as opposed to varicose veins which have a more bluish appearance and are deeper in the skin. 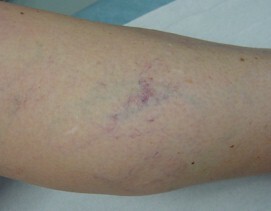 Thread veins commonly effect the face and legs and many people find them unsightly and wish to do something about them. Sclerotherapy is a non surgical treatment which sometimes the most convenient and cost effective option depending on each individual. This involves injecting the area with a particular strength of medicine which will shrink all the veins in the vicinity. Often only one or two treatments are required for the vein to completely disappear. Most people prefer sclerotherapy, however fine thread veins are sometimes amenable to laser treatment. Laser treatment is covered separately on the treatments tab but if one was going for laser treatment anyhow, you can ask the doctor whether they could concentrate on particular thread veins for you during the treatment. The benefit of sclerotherapy is that the doctor can adjust the dose of medicine injected into the vein depending on the size and depth of the vein. This treatment can be used for both superficial, more reddish looking ‘spider veins’ and the deeper bluish looking varicose veins. Treatment times can vary but usually take no longer than 15-20 minutes and if the legs are treated be aware that you will probably have to wear a compression stocking on the leg for 48 hours to enhance the effects of treatment. Prior to any treatment a thorough medical history will be undertaken, and we will judge whether your veins are amenable for treatment. For treatments involving sclerotherapy, for either the face or legs, the consultation and treatment should take about 30 minutes. Compression stockings will have to be worn for 48 hours after leg treatments to increase the efficacy. The pain involved is a sharp scratch and nothing else. If you have any questions, or would like to book in for a Free consultation do not hesitate to contact us.